Welcome to Bed and Breakfast Villa Cappellina Toscolano Maderno. 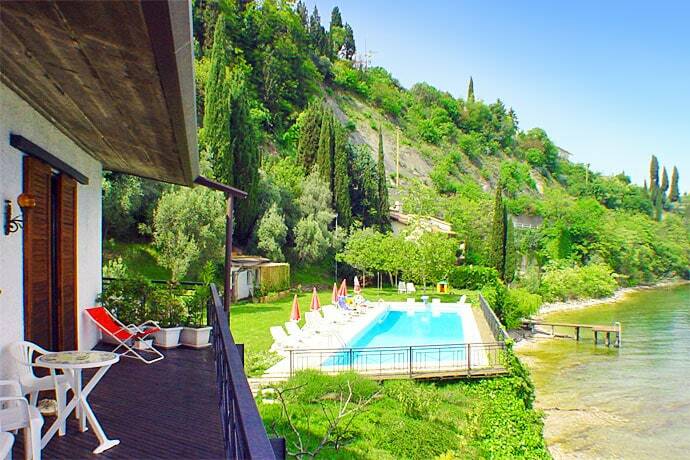 Situated directly on the Lake Garda, in a quiet area under the West Gardesana street, Villa Cappellina is at 1 Km far from Toscolano Maderno and 4 km ca. from Gargnano. A time was a private Villa, it offers few rooms and suites. It lies on a land of 6000 mq with 800 mt. ca. in front of the lake. Reception, living-room, Tv-Sat, breakfast-rooms, balconies and terraces. In the garden there is a swimming-pool (23x7) with sunchairs and sunumbrellas. The beach, the dock and on request bojes are at disposal of the customers. The rooms offer telephone, minibar, heating in case of need, all of them with bathroom or shower/wc, balcony or terrace with lake view. Covered and private parking place. Riding-ground, tennis place in hard ground and the port of Bogliaco is only at 4 km. Villa Cappellina offers (on request) a putting-green of new realization. Animals are not admitted. (Bed and breakfast Villa Cappellina Toscolano Maderno bed and breakfast).